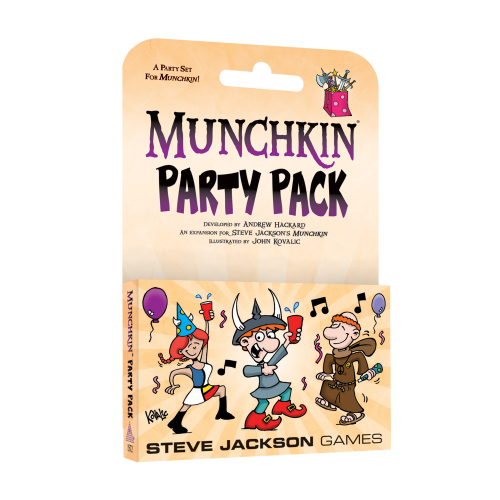 Daily Illuminator: Munchkin Party Pack Is In Stores! November 28, 2018: Munchkin Party Pack Is In Stores! Good news, Munchkin party animals! Our Atlanta warehouse started shipping Munchkin Party Pack to distributors a couple of weeks ago, and it started appearing on store shelves this week. Ask your Friendly Local Game Store to get you a copy or order it directly from Warehouse 23. If you missed our previous news item about the Party Pack, you can still download this fantastic printable certificate you can give to the winner at your next Munchkin party. Keep your eyes peeled for more news and party-planning tips from Team Munchkin!